Launched at MWC 2016, the Alcatel Pop 4 is one of three new additions to the Pop line-up of affordable smartphones. It features mainly entry-level specifications and looks like one to appeal to selfie takers with its front-facing snapper. The Alcatel Pop 4 parades a plastic body, which is a common feature of devices in its maker’s colourful Pop family. At 8 millimetres, the thickness is manageable. It has a curved rear for snug handling and, as usual, offers you a variety of customisation options. The Pop 4 sports a 5-inch display with an HD resolution of 1,280 x 720 pixels. A pixel density of about 294 pixels per inch should make for decent viewing. The Alcatel Pop 4 is equipped with an 8-megapixel rear-facing snapper with LED flash, autofocus, HDR, and HD (720p) video recording capability. Turn the phone around and you are confronted by another 5-megapixel shooter. The selfie camera has an 84.4-degree wide-angle lens and LED flash for great shots. For storing your photos and all, you get 8 GB of onboard storage, which doesn’t appear to be enough for the needs of most users. But storage expansion with a microSD card, by up to 32 GB, is allowed. A quad-core Qualcomm Snapdragon 210 processor gets things moving along on the Pop 4 at a maximum speed of 1.1 GHz. The CPU is paired with an Adreno 304 GPU and lowly 1 GB of RAM. Looking at this setup, it is safe to say this phone will appeal more to entry-level users. Interestingly, the Alcatel Pop 4 will boot latest Android 6.0 Marshmallow – an impressive offer for an affordable device. Power will be supplied to the device by a 2,500mAh battery. The Alcatel Pop 4 supports 4G LTE (Cat. 4) connectivity for blazing-fast mobile data speeds. Other connectivity options onboard include microUSB 2.0, Bluetooth 4.0, HSDPA+ 4G and Wi-Fi 802.11 b/g/n. The phone supports HD voice as well. Alcatel Pop4 is not yet available in Nigeria. When available, you can buy it at leading online stores in the country. 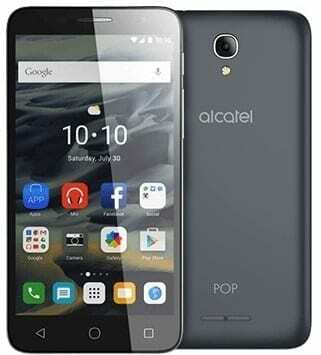 Alcatel Pop4 Price in Nigeria is expected to range from N28,000 to N35,000 depending on your location in Nigeria.